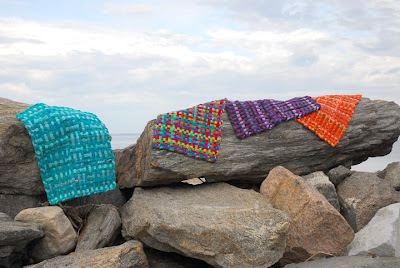 What do Czech orphanages, a Bohemian kingdom, your Mama's junk drawer and Westport, Connecticut have in common? A heroine, that's what. Two heroines, actually. One real, one born from the imagination and ingenuity of the first. The Adventures of Jordanka is the story of a plucky, Bohemian orphan who saves her orphanage and kingdom from destruction. The story was written by a plucky, determined and enviably entrepreneurial Westporter, Jordan Teske. Teske has quite a story of her own (which you can find in detail on my little hometown's best blog 06880). 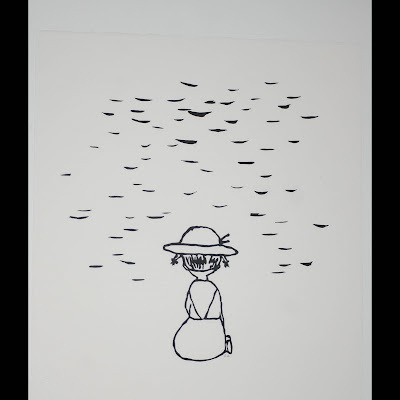 But the crux of it is that she has let her creativity and compassion guide her. She's an MBA with a penchant for international travel who cleaned toilets for a time at the Ritz-Carlton to keep her electricity flowing. Through her travels, Teske encountered both beauty and despair. Incredibly, she's found a way to combat the latter by promoting the former. 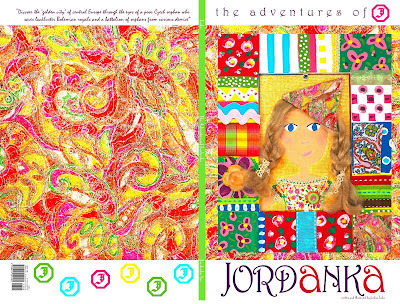 Her book, The Adventures of Jordanka, filled with her original, recycled artwork--made from the best stuff you'd find "at the bottom of your mother's junk drawer"--doesn't just weave a fairytale of an Eastern European orphan in lush and vivid detail; 10 percent of the proceeds from the sales of the book will benefit orphaned, impoverished and institutionalized children in the Czech Republic. It's enough to make you finally sit down and get to work on that book idea that's been bouncing around in your head for a year, isn't it? After all, none of us needs to try to change the whole world. A tiny, little, orphaned corner of it is the perfect place to start. NPR recently tasked their listeners with choosing the 100 best beach reads and today, the results are out. 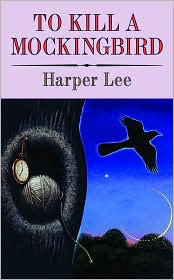 Coming in at number 2 is the transcendent twentieth century work, To Kill a Mockingbird by Harper Lee. Edging this literary masterpiece out of the top spot was...Harry Potter. Being that this is a list of "Best Beach Books" I'll let that go without further comment. The list includes much of what you'd expect--The Kite Runner by Khaled Hosseini, The Pilot's Wife by Anita Shreve and How Stella Got Her Groove Back by Terry McMillan. But there are also some fun surprises like Alice's Adventures in Wonderland by Lewis Carroll, Cat's Cradle by Kurt Vonnegut and Treasure Island by Robert Louis Stevenson. 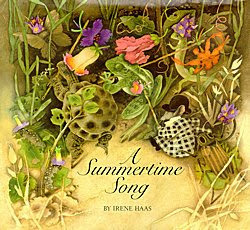 There's much on this list to inspire a trip to your library or local book store before summer fades. And, it's on their swanky new redesigned web site. With her third birthday comfortably behind us, my thoughts have turned toward preschool, which the little one starts in just over a month. When she was born, this day seemed eons away. In fact, it seemed so much a part of the distant, hazy future, that even when I was looking around the area for preschools last fall, I still didn't truly wrap my head around the idea that she'd ever really go to school. Without me. Here we are, the last four weeks of her Life Before School and I find myself quietly panicking about every potential pitfall her three-mornings-a-week schedule presents. What if she skins her knee? What if she gets frustrated and starts to cry? What if she pees her pants? Surely, the depth of my anxiety is indicative of the fact that she is my first and only child. (And of my own anxious nature, probably.) But seriously. How do I just send her off into the world? She's only three! But what's really got me worried is that she is just about the gentlest child I've ever met. She's kind. She's sweet. She's polite. She shares. I'm afraid that the other kids are going to walk all over her like so much rubber playground turf. The slings and arrows of outrageous fortune start flying pretty early. 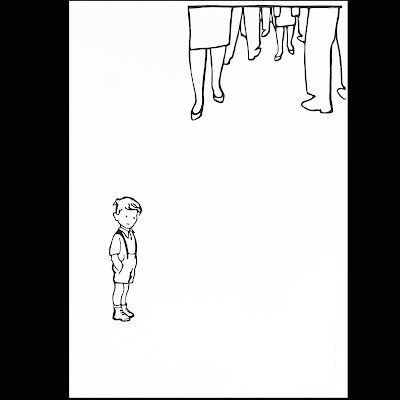 Kids can be mean. Teachers don't really have eyes in the backs of their heads. I'm afraid she might get caught in the line of fire. So then my mind starts running with this apocalyptic preschool scenario and I'm wondering: Am I starting her too early? Should I home school? Perhaps I need to contact the Obama administration about beginning a program to colonize the moon? I'm not fooling myself. This isn't really about her; it's about me. I've been working on striking the right balance as a Mama for a while now. And as much as I worry about whether or not she'll cry that first day (or week or month) that school starts, I know that I will. Someone said that having a child is like letting your heart walk around outside your body. Whoever said that sent a kid to preschool. My heart is currently running around the house wearing her new back pack ("for school") and her new pink tutu. And despite my fears, she looks ready to conquer the world, armed with love and kindness and dressed in pink crinoline. She will do this. And gracefully. I hope I can follow her example. All this birthday-ing has had me waxing a little nostalgic of late. I've been looking at pictures and watching videos from the little one's babyhood and reflecting on how far we've both come since those early, sleep-deprived days. Birth to age 3 is the stage of life where we acquire the most knowledge. We come out totally helpless and learn all of the basic skills required for life--talking, walking, feeding ourselves--in the space of a few short years. I'd also argue that the corresponding time in a woman's life--the transition from woman to mama--is a comparable time of development and learning. I mean, going from 8 uninterrupted hours a night to operating on a POW's sleep schedule is a hell of a learning curve. One of the toughest lessons for a mama, and one that isn't learned in the first 3 years, is that, as much as we'd like to, we can't put bumpers on every corner in our children's lives. And that sometimes, by intervening, we do more harm than good, despite our best intentions. The first time I realized this was almost exactly 2 years ago. I was in our backyard with the little one and a dear friend. We were playing on a blanket in the grass, enjoying the summer afternoon. Then, in a wobbly, wonderful moment, the little one pulled herself up and began to take her very first, unassisted steps, right toward me. 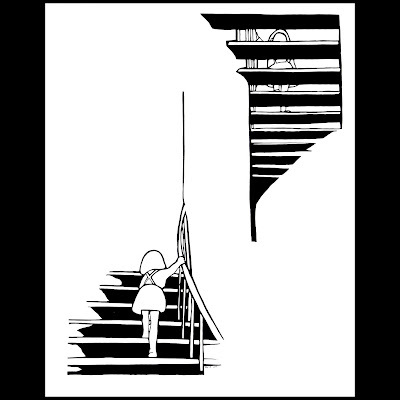 My heart's wings were fluttering as my baby girl took 3 shaky steps, arms outstretched. Then, the swaying started and I knew that she was about to fall. We were on a blanket, in the grass; a soft landing was assured. And yet, I couldn't stop myself from reaching out to catch her, to keep her from falling. As she fell into my waiting hands, one of my fingernails grazed her cheek, scratching her baby skin. She started crying, not because she fell, but because I hurt her, in an effort to keep her from falling. The irony of the moment was apparent to me immediately. Worse, it was weeks before she worked up the courage to try the whole walking thing on her own again, presumably because she associated it with having her face scratched. If I had just let her take that necessary tumble, she would have been fine. And she probably would have pulled herself right back up and tried again. This is one of the challenges of motherhood: knowing when to help and when to hold back. We can't solve every problem or catch every fall. And when we try, we might do some inadvertent damage along the way. Kids need to learn to rely on themselves, to solve their own problems--in a developmentally appropriate way, of course. By encouraging them to do for themselves, we help them build confidence. By letting them take a tumble or two, we help them learn how to pick themselves up and try again. The instinct to save her from every skinned knee or broken heart is still strong. I need to remind myself regularly of that summer afternoon and how I need to trust my child to learn and trust the process of learning itself. As much as I'd like to spare her the heartache and difficulty that are that yang to life's happier yin moments, I know that preventing pain is impossible. The best I can do is teach her how strong she is, how capable and to help her learn the value of tenacity. If I can do this, she'll grow up and be able to catch herself when she falls, which is the best lesson of all. This past weekend offered a lot of fun around my little town, including one of the best fine arts fairs the East Coast has to offer. I found many, many treasures at the fair. Far too many to take home to my already slightly crowded home. But I did find something too special to pass up. Artist Ella Richards' paper cuts were so wonderful I couldn't resist. 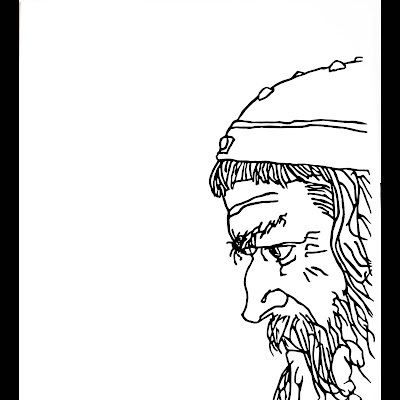 Her work looks like the love child between Shel Silverstein and Dostoevsky, had Fyodor chosen to illustrate his novels. I found several small pieces that will be just perfect in my little one's room. Russian-born and living in NYC, Richards allows both landscapes to inform her art. In addition to being a talented artist, she's also a lovely person. Find her artwork at dancingscissors.com or contact her at ella@ellarichardsart.com. I love a good entrepreneurial story, especially in hard times. 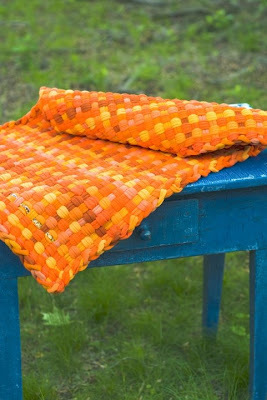 I love it even more when the story involves creative ways to reuse and recycle old stuff. Enter Susan Taylor and Condie Ward, two smart, savvy, earth conscious entrepreneurs I had the pleasure of meeting at my local farmers' market yesterday. These ladies run Rugamarole, a home based business that uses recycled and repurposed textiles to make beautiful new pieces for your home. 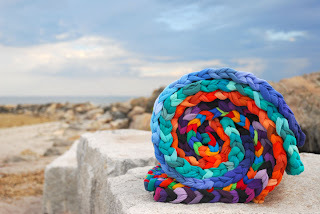 Taking care to use soft fabrics in vibrant colors, their products look like anything but rags. 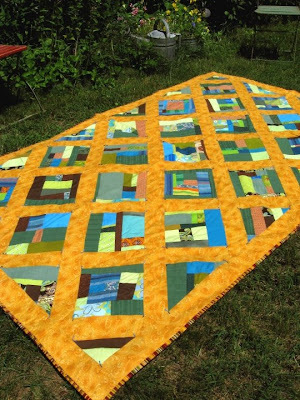 Their wares include rugs from old t-shirts, cozy throws from old sweaters and beautiful quilts from scrap fabrics. Beautiful, practical and green, these ladies have found a way to make their little corner of the planet a bit more beautiful. My little one is turning into a little lady--at least out of the sandbox. When she isn't getting dirt under her fingernails in the yard, she's floating around the house in her lavender tutu wearing any combination of necklaces and bracelets she's accumulating. Yesterday, as I was untangling her Hello Kitty necklace from a red and gold beaded bracelet and a pair of my chandelier earrings (!) 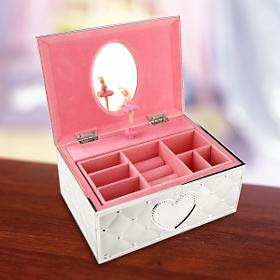 I realized that she needs a jewelry box. 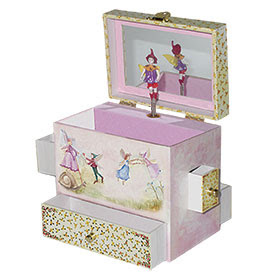 So, with her third birthday only one week away, I am on the hunt for the perfect, girly, ballerina-twirly music box for her to store her treasures. I'll likely find one at a local store, but peeking around online is fun, too. I've found some very sweet, very ladylike little boxes out there. 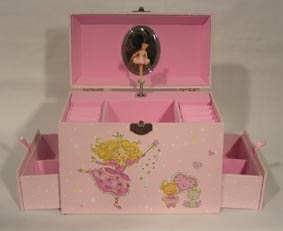 Like this traditional ballerina music box from Lenox, which plays a respectable "Fur Elise" when you open the lid. Just In Case Music offers a more enchanting take on the theme, with painted fairies and a spinning harlequin. 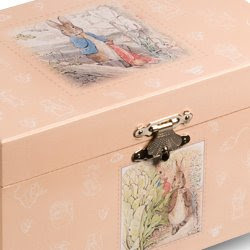 There's also this sweet and delicate Peter Rabbit music box from the San Francisco Music Box Company. In honor of my little half-Frenchie, I make an effort to incorporate a little of la France into la vie. Today, of course, is Bastille Day, a day marking France's move from monarchy to democracy. The French and American revolutions were more dissimilar than alike, despite their chronological proximity. But the ways in which our two countries celebrate are largely the same: parades, picnics, fireworks and an overall feeling of conviviality that belies the roiling angst and unrest that precedes any revolution. This morning, NPR offered a lighter story on Revolutionary Sounds, a music mix of sounds from or inspired by the French Revolution. I'd like to offer my own Revolutionary Playlist, one that's more a mix of political and personal revolutionary songs. After all, you don't need to take up arms to experience radical change, right? 2. It's the End of the World As We Know It (and I Feel Fine) -- R.E.M. My apologies for the unexpected and unannounced absence, Mamas. I will be back to regularly scheduled blogging next week.